A great article – thank you! AfL is a really powerful tool that I use daily in my classroom. The problem comes when the school system just outside is geared heavily towards grades which is certainly something that happens all too regularly in here in the UK. This can lead to the children themselves being all too often hung up them too. Working through this is a real challenge – even with 9 and 10 year olds so goodness knows how hard it is when you are teaching older children and young adults. Great post. In my role as coach there was very little use of statistical data, even though we did keep track of leading goal scorers and assists, overall wins and losses. My conversations with my players rarely included such data, though, because we talked about their observable behaviors- how they were performing on the field, the choices they were making when they had possession of the ball, the defensive strategies they were employing. The other coaches and I were able to model and demonstrate for them how to improve their skills and game tactics, allow them to practice in a supportive environment, and then provide more feedback. The players encouraged each other along the way, and all of that descriptive feedback allowed for personal growth in skills, attitudes, and confidence. We owe the same to our students in the classroom. Thank you for sharing the Black Box article about formative assessment. We’ve been examining the role of assessment in our school this year and this is a must-read for our team! I spent a number of years coaching cross country and track at the high school level. Amazing how we “get it” while we’re coaching, and “forget it” while we’re teaching. Thanks for the reminder, Chris. I enjoyed reading your post and plan to share with some of my teachers. As as former college basketball player, I am a huge fan of sports analogies to the field of education. When I think back to my playing days, the best feedback I got from my coaches was during practice when they immediately corrected my mistakes and demonstrated exactly what they needed me to do differently. Also, watching game or practice film and discussing what I was doing well and what areas I needed to improve in was hugely beneficial. Being able to see myself in action, while they discussed this information on a personal and individual level, allowed me to actual make a positive change in my performance. The statistics were used, but they were used to show the results of my efforts not to provide the instruction. I am currently in my second year of secondary education and I am just facing all these questions myself. I have quite a bit of experience coaching and teaching swimming lessons which has allowed me to have a glimpse into my own teaching styles and habits. I myself find myself “assessing of” and now reflecting on my own approach I feel as though I may have disallowed some of my students to grow. I applaud you for bring this up! I am going to share this with my ed math and coaching theory class for sure! @Hannah – yes, this is a huge problem in BC too. The current structures that focus on percents and grades makes AFL more difficult to implement. Having said this, it is not impossible and we are seeing more and more teachers using the philosophies of AFL. I agree, the older the child, the more difficult it gets as the system focuses more on AOL. Thanks for commenting! @Lyn – Thanks again for commenting. 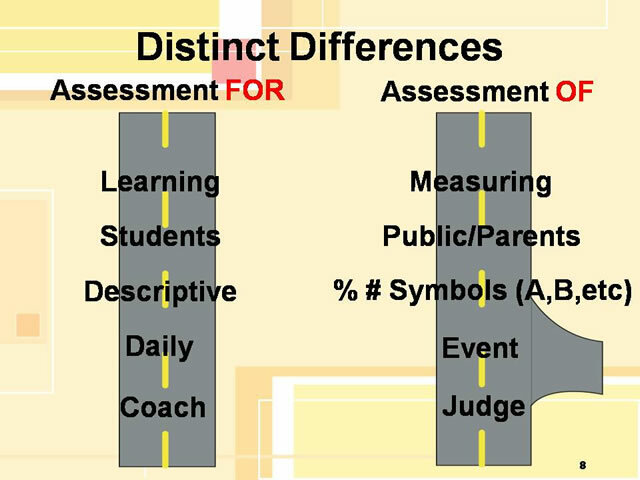 I enjoy our conversations we have around assessment and it is great to see both our schools moving in the same direction. Baby steps is key as this transition is sometimes difficult for people to understand. Thanks for adding your experience as a coach! @Tom – Love that quote.. I tweeted it out! @Sean – So many coaches can relate – great post! @Alicia – yes, I think many teachers can be more like coaches and many coaches can be better teachers. Thanks for commenting and adding to the conversation! @Payton – someone wrote that we need to be data-informed rather than data-driven. Keep the data to ourselves to help us and use feedback to move us forward in the learning process. Thanks for adding your personal experience to the blog! Great post! It reminded me of watching a great Phys Ed teacher /coach, Rebecca Young, in action this year. She gave individual feedback to each student to help them adjust one thing that would help them improve. I was in awe & know that if she had been my gym teacher I wouldn’t have hated gym class my whole school career. A coaching approach definitely fosters a growth mindset whether it is in the gym or in the classroom. Thanks for sharing and reminding me to focus on AFL.